Ben Hill Renovations proudly provides the beautiful city of Marietta, GA with our quality residential and commercial renovation services. What’s not to love about Marietta? With luring attractions like Glover Park, Marietta Square, the Gone with the Wind Museum, and dozens of great businesses, it’s no wonder Marietta is one of Georgia's most populous cities, with 56,579 residents. In fact, in 2011, CNN Money named Marietta one of the top 25 places to retire in the United States! A city like that deserves renovation services befitting of their unique charm. Marietta Windows play a significant role in the curb appeal of any resident’s home. They affect the aesthetic of both the exterior and interior environment of the home. Windows regulate the amount of light that enters, as well as temperature and quality of air. Well-installed windows from Ben Hill Renovations are not only visually attractive, but will save you money on energy bills, and maintain better air quality within your home. Marietta Siding renovation will take your building or home from drab to fab! Siding is one of the most influential factors in the appearance of a home. Broken and ugly siding lowers the value of a home, and communicates a lack of care for the property. Give your house a facelift with our Marietta siding services! Marietta Roofs done by Ben Hill Renovations are strong and durable. A roof should have a lifespan of about 20-25 years under normal conditions- that is, if it is installed correctly in the first place. You can have peace of mind that, when you hire Ben Hill Renovations for your Marietta Roofs, we won’t send amateurs that will cut corners and do shabby work. We only send skilled and experienced professionals! Marietta Decks are some of our favorite jobs to do! Building a custom deck that matches the beauty of your home is what we love. Decks are wonderful places to sit and relax alone, spend time with family, or even have a barbecue party with all your closest friends! We’ve never heard of anyone who doesn’t love the idea of having a gorgeous deck built onto their home. 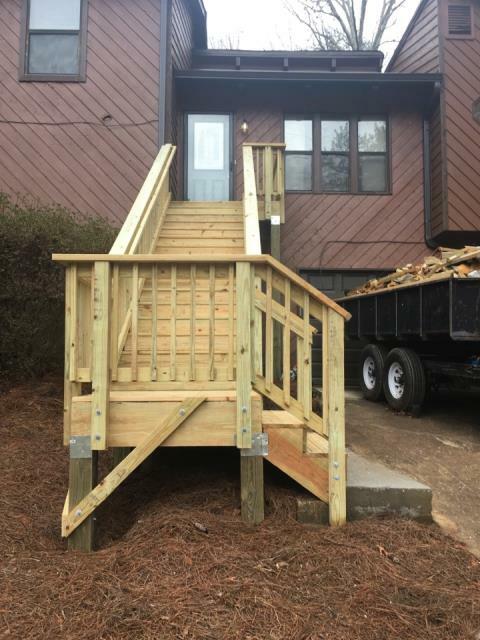 When you need a Marietta deck, there’s only one name you can trust to build a custom deck that suits your needs, and compliments the appearance of your home- Ben Hill Renovations! Marietta Exterior Renovations keep the city beautiful! Just think about it, if every homeowner maintained the exterior appearance of their homes, property value would skyrocket! Our Marietta exterior renovation services are second to none.